Are there many words combining both space and time? A quarter is one of such rare words: it means both a part of the city space and a period of the year. A regular city has parts bordered by four streets. For example, Chita is a city with an absolutely orthogonal historical center. This Utopian city was designed by Decembrists in the depth of Siberian ore-mines (120). The 130 Quarter in Irkutsk is irregular from its inception because of its triangular form. Located between two roads, the forked quarter was initially bordered by flows along the west-east axis – the main direction of the country. That is why it appreciated the gift for the 350 anniversary of its transit existence – a promenade for an unhurried flow of pedestrians. The quarter manages this flow quite well, while overcoming the difficulties of new existence and gathering myths (102). 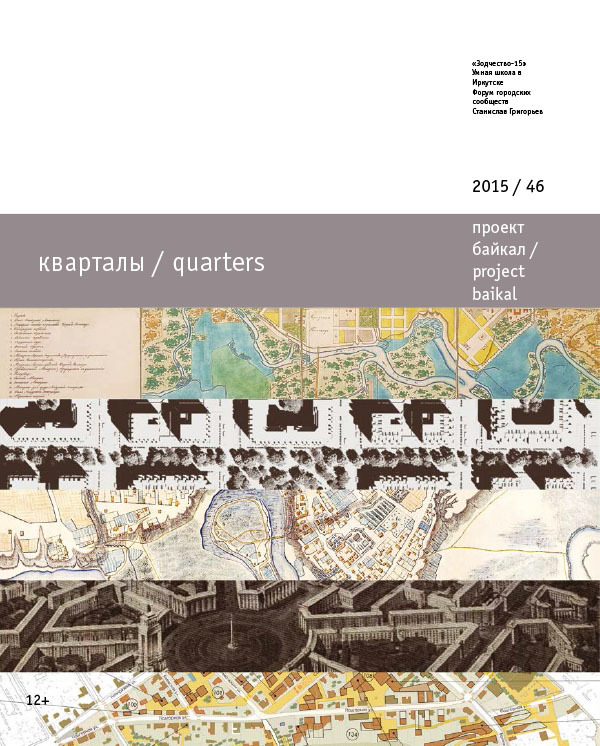 Arousing many expectations, the “Irkutsk’s Quarters” project continues the theme that was begun by the 130 Quarter and involved regeneration, revival and search for Genius Loci and the key to each single quarter (74). Beaded on the trading axis, these shabby and unfriendly quarters full of rubbish should be transformed for the good of inhabitants, guests and the small business. The triptych by Lidin, Rappaport and Nevlyutov is about happiness of urbanship and cities for people, too (58). The City Community Forum was also devoted to the urban theme (114). Going through the last quarter of the year, we hope that Irkutsk will keep to the right policy, so that in the near future the wooden downtown quarters will become its pride, and the design, construction and investment complexes will join in desire to increase the number of comfortable and lively quarters in our city. The Baikal Beam will get one more landmark: the Smart School (22) for Irkutsk’s children, including orphans, will be built in several years on the bank of Chertugeevsky Bay. GRIGORYEVA, Elena. quarters. project baikal, Russian Federation, n. 46, p. 1-1, dec. 2015. ISSN 2309-3072. Available at: <http://projectbaikal.com/index.php/pb/article/view/930>. Date accessed: 23 apr. 2019. doi: https://doi.org/10.7480/projectbaikal.46.930.